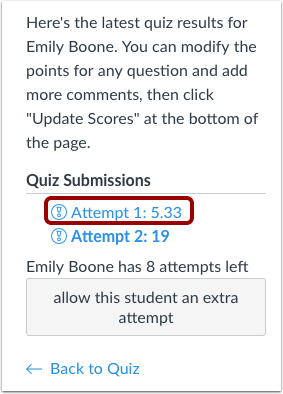 You can view student quiz results within each quiz in your course by viewing the quiz results page or moderating the quiz. If a student has multiple quiz attempts, you can also view results of all attempts. 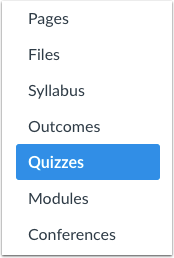 As an instructor, you can choose the type of quiz results to display to students as listed in the quiz options. Click the Options icon , then select the Show Student Quiz Results link . Under the heading Students who have taken the quiz, click the name of a student. The sidebar displays each attempt and the score for each attempt . In the content area , Canvas displays the results of the most recent attempt by default. The attempt number being viewed is shown in bold text. If there is more than one attempt, you can view past results. To view a past attempt, click the attempt you want to view. The results of the quiz attempt will appear in the content area. 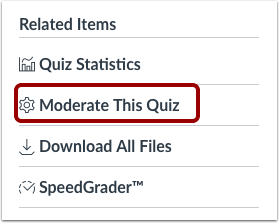 You can also use the Moderate this Quiz page to view quiz results, along with the overall number of student quiz attempts. Click the Moderate this Quiz link. View the number of attempts and the most recent score for each attempt. To view results for a specific student, click the name of the student. Previous Topic:How do I manually submit outstanding student quiz submissions? Next Topic:How do I view a quiz log for a student? Table of Contents > Quizzes > How do I view student results in a quiz?